Well, you should not worry about your mods. I think we all learn something from this competition. Me at least. Now that I've saw some plays I better understood the keen physics and what can be done. And now I do appreciate more the levels I didn't beat in my video. Keen 1 is not my primary focus. I only play Keen 1 when there's a new mod out and that's rare. There's a big downside of this competition though. You're waiting for months and when it's finally out, the fun lasts for only 1-2 days. Start it now, deadline in a few months and it'll probably work out. Heck *I'll* direct it if need be. Things aren't too fast-paced around here. Maybe Keen 2 this time? Similar kind of restraints? Let's add a third tile type on top of the the solid block and fire. Let's get WILD baby! what about a mod title screens competition first?! only red black and blue colours of course, to stick with the theme. I'm very interested in participating in another community levelpack. To me, they are a very good excuse to make a Keen level. Maybe we could do a different kind of minimalism competition. 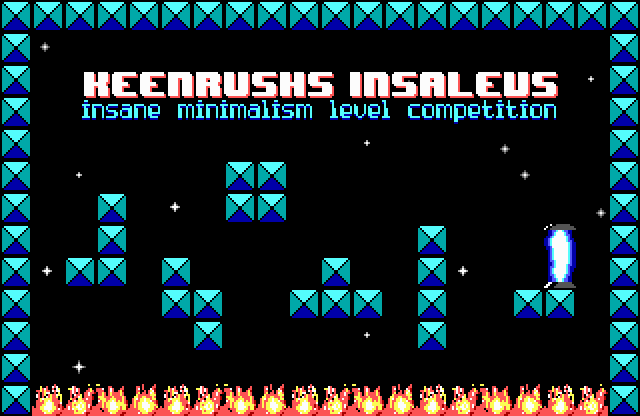 What about screen-sized levels (like what Xky1rooms did)? Anyway, has anyone seen the level maps of this levelpack on KeenWiki yet? They somehow look rather cool in my eyes when they're zoomed out. I thought some of them looked as if the blue was the background and the black are the solids instead of the other way around. Anyway, has anyone seen the level maps of this levelpack on KeenWiki yet? what do you guys think about it?! Last edited by Nisaba on Mon Oct 22, 2018 23:00, edited 1 time in total. Actually. Thank you for that. Supreme laziness was settling in and I needed that rousing speech to help me out of it. And thank you Quinton and Nisaba for the KeenWiki entry. The levels look amazing. If there is to be a tile added to the current bunch, which would make for the best addition? A shelf? like this tile? On a side note, after watching Fleexy's run, I realized you can skip half of my level in a way I did not foresee. I can't believe I was enough to not see something as simple as that. Oh well, there's still extra challenge for you maniacs who want to complete it the hard way. @KeenRush what's your opinion on that?! Assuming you're talking about the title screen, I think it looks really good. Thanks. Good to see the wiki entry. I had yet not seen my level in full. Grimson: Heh, looking now at the map of your level, I'm not sure that I would have been able to complete it the intended way! I'll have to try that soon. Removing the shortcut would just be a matter of inserting two wall tiles where I did my final jump down. In the Next Collective Pack department, I was thinking about running a machine-assisted Keen 5 leveling competition. If people are fans of the minimalism thing (e.g. with Keen 2), I'd also be happy to do that. If the latter, I think it'd be good to involve one new tile type, since otherwise it would be effectively the same deal with slightly different graphics. I would suggest a jump-up-through platform tile. Haven't gotten to try all the levels yet, but thanks for doing this everyone, especially Keenrush! I was actually surprised it took so long for people to figure out the top fire trick in my level. I was hoping my level would stop people from advancing until they figured it out, but I underestimated how good people are at doing tricky jumps to avoid using the invisible bottom. I'd like to see a Keen 5 competition using your level generation tool Fleex. Maybe people would pick a nice looking random-generated level and try to polish it up to be interesting. But, that could be pretty broad and require people to learn more advanced Galaxy level editing, so maybe it'd be too much. If Keenrush is up for it, I'm also hoping we could see Project Stardust finished at some point. Removing the shortcut would just be a matter of inserting two wall tiles where I did my final jump down. You're welcome. Good to know I could help someone with that. I think if we're going to use another tile, maybe it should replace one of the three we already have so as to not reduce the minimalism aspect. I wonder what that would be like to build a level with no blocks but one-way tiles... you wouldn't be able to block passage from any direction but up. Could make for an interesting design challenge. Start it now, deadline in a few months and it'll probably work out. Actually, after observing this competition it looks like a good way to get people to do levels is to have the deadline a few weeks after the announcement, then when it's almost here and some people have done their "AAH! DEADLINE! QUICK! LEVEL!" submissions, extend it a bit. This would repeat until there is a sufficient amount of levels. But to keep people on their toes, it could be kept a secret whether it's the final deadline or not. Also, good work on the title screen, Nisaba. Perfectly minimalistic design.